DUMBARTON fought bravely but were outplayed by Ladbrokes Championship leaders St Mirren at the YOUR Radio FM103 Stadium. 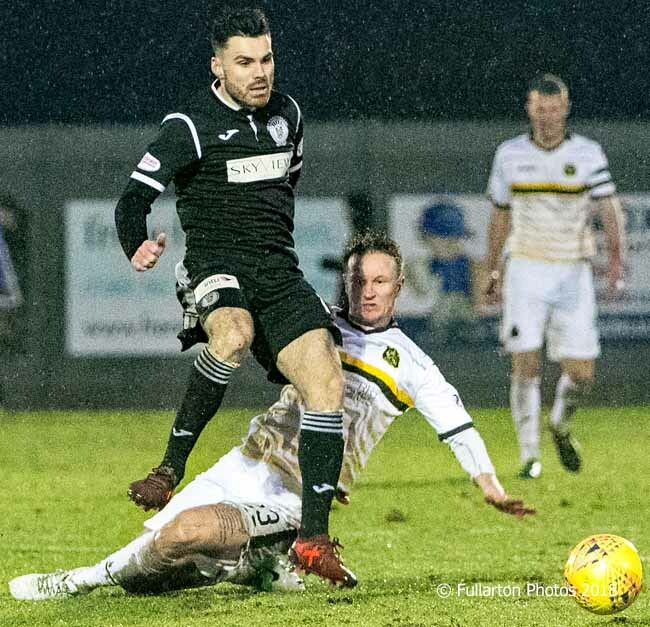 DUMBARTON fought bravely but were outplayed by Ladbrokes Championship leaders St Mirren on a foul day in front of a 1,652 crowd at the YOUR Radio FM103 Stadium. Losing 2-0 despite a gutsy performance, Sons at least had the consolation of seeing striker Iain Russell (pictured) return fifteen years after he first played for the club — looking in good form despite not having played for seven months. Sons competed well and strongly in the first half, but could not find any traction up front, while the Buddies had the best of the play. After the break it was pretty much all one-way traffic, apart from the final ten minutes. The crucial moment came in the 47th minute, when Dumbarton were caught napping at the back and Liam Smith crept in to nod the ball home from close range. The game was effectively wrapped up not long afterwards. In 58 minutes Stephen McGinn hooked the ball goalwards from a corner, and it nestled into the bottom corner of the net. Sons tried hard to grab something back towards the end of the game, with Iain Russell coming on to make his second debut. On 81 minutes Tom Walsh had the best — and virtually the only — direct chance for the home side, but his powerful volley went straight into keeper Craig Samson's arms. The defeat keeps Dumbarton in eighth place, clear of Falkirk on goal difference.